First off let me say we finally did it! After living on Oceanna for over a year and half we have successfully spent an entire night sleeping on the tramp! Don’t get me wrong, we had tried before. 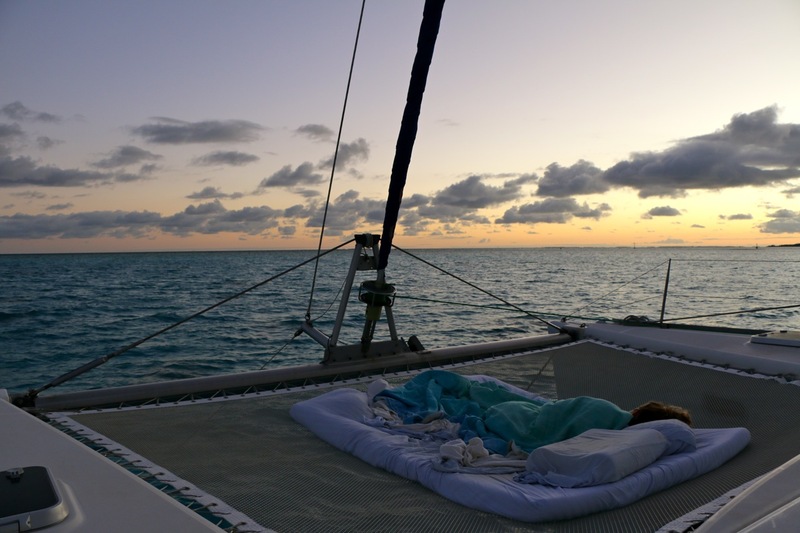 When we first started out in the Bahamas we were uber keen to sleep out under the stars. Time after time we would tuck ourselves in up there completely over the moon with our lot in life, only to be rudely awaken by a night-time rain shower. After the third or fourth time we had to haul our quickly dampening blankets and selves inside at some unseemly hour we officially lost our enthusiasm for experiencing a night on the tramp. Until last night! Bolstered by a bottle of wine and a top shelf sunset, we buried our previous failed attempts and took our pillows out between the bows. Our dreams were precipitation-free and the all-encompassing morning light was a brilliant way to start the day. A day peppered with great finds. The morning surf was not as good as yesterday’s session, though it was surf so no one was complaining. I, in an expedition to the back corner of our tiny freezer, found the pumpkin I had carefully stored there for a vegetable-depleted time such as this. And later during a late afternoon paddle we stumbled upon a trifecta of treasures. First off, as we wove around the few small motus situated near the anchorage we happily turned a corner to find ourselves in a river-like pass secluded in its own tropical paradise. We had rounded the outer point of one motu to ride the incoming tide down the shallow channel situated between it and its neighbour. It was stunning and it was here that we heard the call of the Tuamotan Sand Piper. Now I have already established that we are by no means bird people, but Gregory was recently reading a guide that reported on the rare little bird. The Tuamotan Sand piper is said to exist in this remote area in very few numbers. Some report as little as one hundred of these long-beaked, beach-running, cat-calling fliers remain in the world. What do I mean by cat-calling? Well the only way I can think to describe their song is to say it sounds exactly like a construction worker whistle. A quick, loud, and crystal clear woo-wooo! Completely unmistakable. It had us checking over our shoulder to see where the action was happening, when out of the corner of your eye you’d catch this small ball of feathers scurrying across the sand on its long stick legs. The chase was on! Gregory tracked the Sand Piper from one motu to the next. Guess all that’s needed to instill a little bird craze is to say there’s nearly only double digits left and boom, you’ve created a birder! Once the bird had left the premises, or more realistically just made itself less findable by keeping its filthy mouth shut, we took to the pastime of a closer related animal – tree climbing! Actually Gregory did and it was in the hunt for coconuts. A hunt that was more than profitable. We had collected more coconuts than we could even dream of carrying half home. Lucky for us, Andy and Megan and their opportune Water Taxi were on the scene to ferry home our coconut haul. And no deed that helpful goes unpaid, and the best currency available in Fakarava? Gin and pizza.